From 1956 to 1961, I attended Prince Henry's Grammar School in Otley, Yorkshire. During one of my English lessons, in the early years that I was there, we were asked to write a poem about an animal. 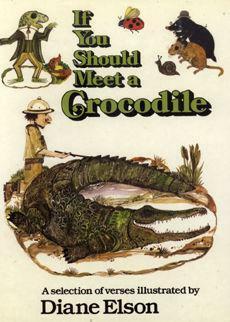 For some reason, and I don't recall why, I chose the crocodile; I can only assume I'd recently learnt or read something about crocodiles. I remember quite vividly writing the poem on a piece of paper, not in an exercise book, and changing the “Whenever” to “Whene'er” to lose a syllable and keep the rhythm of the poem. I wrote my name at the top of the paper, handed it to my teacher and never really thought much about it after that. 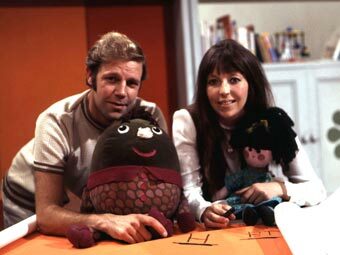 About 20 years later in the mid 1970's, by which time I'd grown up, married and was bringing up my own children, my daughter and I were watching BBC's Play School (a British children's television programme that ran from the mid-1960's to the late 80's), when the presenter read out my poem. I was speechless! I knew then of course that my poem had been published. I wrongly assumed that someone else's name would be accredited to it. Baffled and confused; I couldn't work out how the BBC had got hold of my poem some twenty years after it was written. I told my husband when he got home and my friends and family; they were amazed and mystified. I didn't try to contact the BBC, the corporation was so less approachable in those days, unlike these times of instant communication and the Internet. The details of how the BBC got hold of my poem seemed so trivial compared to the other events of our family life; my husband's career, the children's education etc. I put it out of my mind after that; except when my children asked me to tell them my “Famous Crocodile poem from Play School”. I never thought I'd see or hear it again, how wrong could I be?! 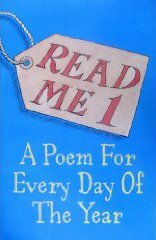 In February 2006 my daughter was reading “Read Me 1” by Gaby Morgan with my grandson when she came across my poem in the book. She instantly recognised it as my poem, even though it was credited to “Anon”. After searching the Internet myself I discovered that it has been published in many books worldwide and forms a part of the curriculum primary schools and the BBC School's Service. I wrote to four of the publishers asking if they could provide more information about how the poem came to be published. Although I received replies, none of them were able to help. I wrote to the headmaster and head of English at my old school, Prince Henry's, but neither of them replied to my letters. I was quite surprised as I thought they would be really interested to hear an ex-pupil's story. I didn't know what else I could do and although I registered my poem with the UK Copyright Service on 8th November 2006, I was still very frustrated. With my limited abilities of the Internet, I found six books, which had my poem's name as the title. One was published by Diane Elson in 1979 and one by Margaret Mayo in 1974. As these were the earliest publications I could find, I tracked down the authors' contact details and wrote to both of them. I was so pleased when both authors took the time and trouble to reply with really nice letters. Unfortunately neither could help in any way, however Margaret Mayo suggested that she could have found the poem in one of Barbara Ireson's anthologies. Between then and late 2009 I trawled the Internet searching for more publications of my poem, searched Friends Reunited in the hope of finding a lead there and had spells of inactivity when I felt it was all to no avail. 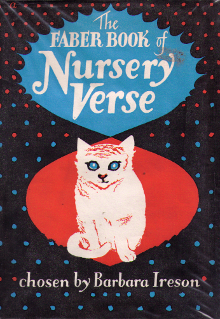 Then my son (who is much more adept at sifting through information on the Internet) found a publication of my poem in a book called “The Barnes Book of Nursery Verse” published in 1960 in the USA by A S Barnes & Co, Inc. It was compiled by Barbara Ireson! This was another shock as it meant that I was still at school when it was published and it had made a very swift transition from Prince Henry's all the way to America. I wrote to A S Barnes (now known as Barnes & Noble) and, as expected, got no reply. I also wrote again to the head at Prince Henry's and this time received a very pleasant reply from the new headmistress (Janet Sheriff). She was intrigued by my letter and had discussed it at a governors' meeting. Unfortunately she confirmed that the school does not have any records going so far back and that the governors were unable to recall any relevant information. She did however suggest that I contact the Leeds Archive Service. It struck me as very strange that the first publication of the poem should be in the States, so my son and I continued searching and sure enough found “The Faber Book of Nursery Verse” again compiled by Barbara Ireson and this time published in 1958 by Faber and Faber of London. I believe this to be the first publication of my poem, as it was only a year (maybe a little more or less) after I wrote it. One thing seems certain though; that Barbara Ireson is the key to this mystery. I'm currently attempting to get in contact with her - or her family, in the hope that I can find the missing piece of this most puzzling of puzzles. I made contact with Barbara Ireson through a publisher and had 2 telephone conversations with her. She said she couldn't remember where she got the poem from but - she said she did live in Leeds at that time (I went to school in Otley which is only 8 miles from Leeds). Barbara was very keen to hear all about my little poem and my quest to get recognition, unfortunately her health has taken a turn for the worst and I haven't had much contact recently. If you're reading this Barbara, I hope you are feeling better soon. I also contacted the Leeds Archive Service and the result - I have no doubt - has solved the mystery! In May 1957, a Mrs G Jones joined Prince Henry's Grammar School as English teacher. She had just graduated from Leeds University. This tied in with me remembering that the teacher in whose class I wrote the poem was “young” and “new”. Further research has shown that Barbara was in Leeds at that time as her husband, Professor John C Ireson taught at the university and his subjects were French and Poetry. They now live in France. The link has been made!! Copyright © C F Fletcher. All rights reserved.